OPERA OBSESSION: Ecco un artista! Due in part to Mr. Bondy's staging, this was a gritty Tosca; no period-piece aura cushioned the brutality of the events. Angelotti is not the only one without a place to hide. And Scarpia is not the only hypocrite: the Sacristan is filching Cavaradossi's lunch even as he mutters the Angelus. I could revel in the details ad infinitum; thanks to Luisi, there was never a lapse in energy through the opera's many changes of pace and mood. I don't feel remotely equipped to critique Luisi; all I can say is: thank you, Maestro, for a reading that brought out the glorious details in Puccini's emotional roller-coaster of an opera. Racette was throughout a fairly gentle diva: the Tosca who is "buona... ma credente" according to Mario, "troppo bella e troppo amante" according to Scarpia. Since I own Callas and Milanov, I'm used to more fireworks, but she had a lovely warm timbre and was secure throughout her range. Her performance was vocally and theatrically integrated, as well, letting us see Tosca's foibles without sacrificing sympathy. From Act I onwards she established a tendency towards self-dramatization, playfully aware of the fact in her Act I seduction for Mario, utterly charming, positioning herself as if on stage in front of his painting, sometimes utterly unaware of it (dragging Mario's dead weight into her lap in Act II to cradle him in a terrible echo of a Pietà), and sometimes somewhere on the spectrum between the two ("Il tuo sangue o il mio amor...") I was impressed by her use of the libretto's stage direction that Tosca, when finally seeing her Mario (here dragged in on a shroud-like tarp!) as she has so long demanded to do, can't bear it, and turns away. I had always mentally dismissed this as far too 19th-century-shrinking-violet, but Racette just gave a sickened moan, hands to her mouth; flinched as if struck... and then went to him, choking back sobs. Her "Vissi" passed the litmus test of sitting on the edge of one's seat hoping the singer will acquit themselves vs. sitting back and relaxing into the beauty of the music. Scarpia, coiled, rather than stretched lasciviously, on the other sofa, listened attentively... and then, with mocking deliberation, clapped as if for a theater performance, acknowledging the dramatization, dismissing the despair. Chilling! I know it's a terribly, reprehensibly reckless thing to say when only a few years into a lifetime of opera-going, but I'm going to say it: if I never see a live Scarpia this good again... that's all right, because I have seen this one. Terfel was Scarpia: repulsive, magnetic, menacing, seductive. His characterization was repellently evil without ever descending into mustache-twirling; every bit of the magnificent melodrama seemed perfectly natural. He had the taut self-control, and hypnotic fascination, of the predator he was; and he enjoyed every minute of his sadistic manipulations. (I hasten to defend Mr. Terfel himself as a thoroughly avuncular type, and a philanthropist to boot.) Here, however, he incarnated the Evil Baritone par excellence, with incredible control over his voice: audible over chorus and orchestra in the "Te Deum," lowering his voice to a sensual whisper of music for that fateful "Ebbene?" Dallying with prostitutes, flooring unsatisfactory henchmen, then exercising relaxed seduction and directing savage torture at the same time... all in a day's work for this terrifyingly human monster. The accident of physique didn't hurt; I knew the man was tall, but hadn't been prepared for how intimidatingly huge he appeared, looming over Tosca as he bargains for her desired body, casually tossing one of her legs off the sofa in the last instant before the stabbing. And, in an alpha male gesture that I found sinisterly effective despite being anything but subtle, pacing in front of Cavaradossi only to come and lean his elbow on the painter's shoulder as he urges, "Via, Cavaliere, riflettete..." He was absolutely brilliant, and I only wish he had gotten more bravos. Although many in the audience stood to applaud him, I've heard better rounds at the Met for merely satisfactory performances, and this was something else, a sneering, leering masterpiece of baritone excellence (and villainy)! I'm not sure this was the vocal peak which has earned Kaufmann apotheosis, according to some, and sober reviewers exclaiming that they have never heard, do not expect to hear again, such sounds... and that makes me even more excited, because it was still devastatingly good. And if this man creates performances of this vocal quality and this theatrical intensity on a regular basis, fasten your seatbelts, folks! (Sorry, couldn't resist; I had her voice in my head.) Kaufmann is on record as having once thought of Cavaradossi as a "relatively prickly type," an opinion which he also happily confesses to having altered. And in this performance, he created a Cavaradossi who was alive, present, credible in every gesture, a man passionate about justice, passionate about art, and passionately in love. Nor was this painter lacking a core of emotional and physical steel. From the moment he strode on stage, this was a Cavaradossi with panache (whose boots, and gorgeous Act I coat, I covet.) There was a lot of humor in his interactions with the Sacristan: for all the latter's complaints, he hasn't cleaned the brushes adequately, and our Voltaire-sympathizer has to wipe them himself with a shrug and a grin, before lapsing into the romantic reverie of "Recondita armonia." Following in the footsteps of every great tenor of the last century is a tough assignment, but it was a beautiful, tender reflection, with a long-held final note, sung piano, which made me catch my breath. By the entrance in Act II, gone was the boyish good-humor; Spoletta's henchmen dragged him in by the shoulders, gave him a couple of solid punches to quiet him down, and fairly shoved him down the steps. Tal violenza, indeed! Which made the exchange with Scarpia still more pointed; the man says "Aspetto!" when he's still hunched a little forward to accommodate bruised ribs... oh dear! His and Terfel's confrontation was mesmerizing. "Vittoria!" was in no way disappointing, ringing high notes succeeded by incisive phrasing for "L'alba vindice..." And the man is an actor. "E lucevan le stelle" was sung, not with the expected word-painting of remembered sensual pleasures, but softly and with an Innigkeit which made it all too clear that this was only a memory for the man alone on the battlements before the dawn, cold, alone, and in pain. And speaking of pain... after the brief, exquisitely tender interlude of "O dolci mani," I was denied the consolation I usually take in the ecstatic anticipations of the future shared by the lovers. Because the man knew. (I knew this was an option, but was unprepared, since Alvarez, this production's previous Cavaradossi, had been blissfully deluded.) Here, from the moment she explained the "ploy," he knew, gazing at Scarpia's signature in shock: Liberi? 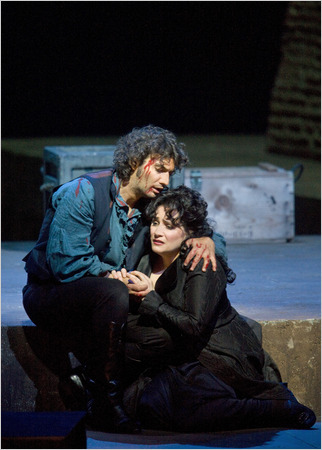 Now, in Tosca's defense, the stage convention of partial convalescence for our tenor between Acts II and III was not observed here, so her lover had plenty of excuses for blank abstraction, and she was concerned, caressing him, holding him, reassuring him. And for one glorious moment in their "Trionfal..." (again with the amazing orchestra) he almost believed it. He falls to his knees in front of her, echoing her own gesture of "scenica scienza," as he makes his empty, comforting promise. And then he stands and grabs her, in the embrace he knows is their last. The guards haul him off her. And he stands straight for her, as she watches and waits and loves him. Racette did brilliantly, breathlessly waiting for the guards to leave, then turning to her Mario, radiant with joy: Presto, su. It seemed all too likely that this much-abused man might merely have fainted. ...Finire cosi?! Her desperation was not histrionic, not hysterical. It was absolute. She was devastated. So was I. Well, that was cathartic. Back to real life now, not unchanged. Thanks for the link! I linked to you too, I don't have an enormous number of readers but hopefully I can send a few your way. Wow what a great review. And lucky you to have been there. If only this was the version they had recorded!